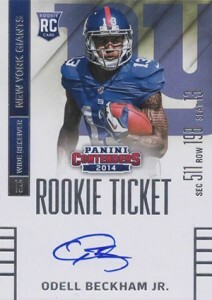 Contenders is a brand synonymous with rookie autographs. It's so established that it's one of the few brands in the hobby where the name trumps just about everything else. 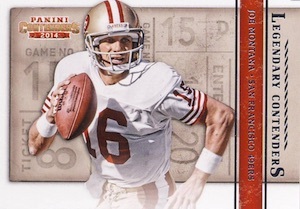 Rookies might not come serial numbered or with jersey swatches yet they usually command more interest on the secondary market than many of their rarer counterparts. 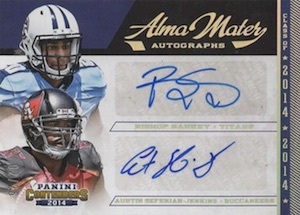 2014 Panini Contenders Football hobby boxes come with five autographs, at least two of which have on-card signatures. Leading the way are the Rookie Ticket Autographs. Among them are the 40 players from the 2014 NFLPA Rookie Premiere that have on-card autographs. 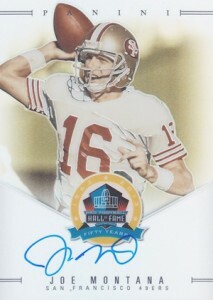 Parallels include Playoff Tickets (#/199), Championship Tickets (#/99), Cracked Ice (#/22) and Super Bowl Tickets (1/1). There are also Printing Plates. 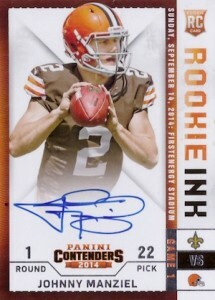 Collectors can find lots of Rookie Ticket Autograph variations with some players having more than one. This isn't the only place to find first-year autographs. 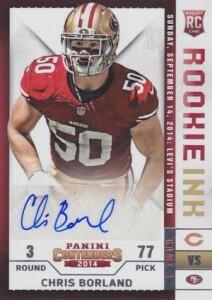 Rookie Ink has signatures from 40 players. All are hard-signed. Parallels include Gold (#/99) and Holo Gold (1/1). Rookie of the Year Contender Autographs deliver more on-card signatures from 2014 standouts. Veteran and legend autographs are tough to find but not impossible. MVP Contenders Autographs are numbered to 25 of less while Legendary Contenders Autographs have no more than ten copies each. Dual autographs are available with Alma Matter and Round Numbers Autographs. Both are numbered to 25 or less. 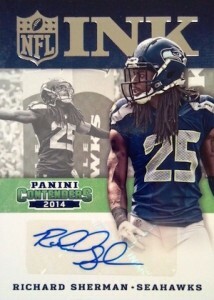 Besides the signed cards, 2014 Panini Contenders Football has a dozen basic inserts or parallels per hobby box. These include a lot of familiar names like Touchdown Tandems, Draft Class and Rookie of the Year Contenders. 100 cards. Shop for base sets on eBay (100 cards). 85 cards. 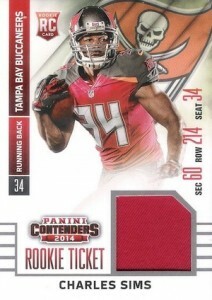 Refer to the Rookie Playoff Ticket section for information about parallels. Short prints are noted below: SP = 250 or less, SSP = 50 or less. Specific print runs are also provided. 40 cards. Click here for a detailed variations guide, images and exactly what to look for. 82 cards. Click here for a detailed guide, images and exactly what to look for. Short prints are noted below: SP = 250 copies or less, SSP = 50 copies or less. Specific print runs are also provided. *Not all cards found in each parallel and some players are only found in the more limited parallels. Refer to the Excel document to view full checklists for each parallel. Short prints are noted below: SSP = 50 copies or less. Specific print runs are also provided. 78 cards. Serial Numbered #/199. 30 cards. Short prints are noted below: SP = 250 copies or less. Specific print runs are also provided. Short prints are noted below: SP = 250 copies or less. Specific print runs are also provided. Not all cards found in each parallel. Refer to the Excel checklist for detailed information. 40 cards. Short prints are noted below: SP = 250 copies or less. Specific print runs are also provided. 40 cards. Short prints are noted below: SSP = 50 copies or less. Specific print runs are also provided. Just bought two boxes- 2 stars at best! Way to go, Panini. When you are not cutting off heads of baseball players, you are putting out cards of poor photography for basketball and football. Just picked up some from Walmart I like the texture feel of the cards I think there nice looking too! Just opened a blaster box from Walmart. It had guaranteed a rookie jersey card which I got one of Andre Williams and other cards. I think the design is really nice and it was a fun pack and in my mind worth the money because I also got an auto. It was a Xavier Su’A-Filo rookie ticket auto that was really nice. I think I got my money’s worth. I know that the Redskins didnt have any first round picks in this years draft but why has Panini added cards for undrafted free agents when there are perfectly good drafted players like Breeland and Moses that do not have autos in this! Pretty disappointing. Am I the only one that notices that C.J. Mosley isn’t in the Rookie Tickets checklist? Of all players I would like to think that the more than likely NFL Defensive ROY would be in here. Wow!!! Just scooped up my 1st hobby box and scored two Round Numbers Rnd 1 Sammy Watkins & Mike Evans RC & with their autos on the other, ROY auto Terrance West, Playoff Ticket of the gronk & a SB ticket 1of 1 auto of Stephon Tuitt…along w other rookie auto’s. I opened 2 full cases as this is one of my all-time favorite products. I do like the card design this year but am disappointed with the lack of some great rookies as mentioned by other commenters. As far as what I got for my money ……. Well I could have gone to Vegas and had nothing to show for it. Maybe I have one of the super low print-run autos sitting in my pile and it will all be good. I like the design and the quality of the cards. 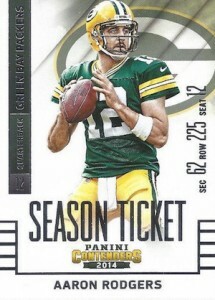 I also think Panini did nice job with collation as you don’t need to break several boxes to pull Star Base RC’s. I also think you have a good chance of pulling high $$ cards from this product. Championship Ticket Carr Auto /49, Jordan Matthews Cracked ice Auto /22, Pulled from 2 boxes. Multiple other nice rookies as well . Picked up a blaster from Walmart and did pretty good. Bishop Sankey Rookie Ticket swatch and a Russell Wilson cracked ice numbered to 22. 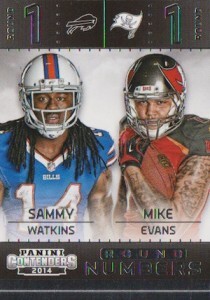 So for this is the only product that Panini got right this year. 5 autos with and unexpected bonus, each box had an additional hit auto or points in each one. Each box had at least 1 solid sought after rookie auto and 2-3 meh players. A much better mix vs some of their products released earlier this season. One thing that we did note was that there may be unannounced “hot boxes” as one of our boxes had all parallel hits. 1. Michael Sam is till in yet another late/end of season product. 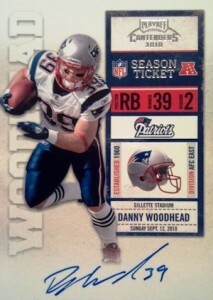 Unfortunately for me, I got a Playoff Ticket auto of him. I do not understand why they do not pull players that failed to make 53 man roster from the product. He was cut in October and this product was released in Jan. This is a major letdown for collectors. 2. I did understand the logic behind using sticker autos for low numbed hits. We hit a Seastrunk numbered to 10 but it was a sticker auto. BUT you can get a non-numbered hard signed. So not sure what the logic is Panini but it think its a bit off. So far Select and Contenders have been the only products that have been worth the money this year. I just purchased a case of blasters and I couldn’t be happier with the results. 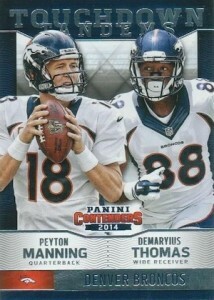 It’s a great product really like what panini did with the cards this year great designs. Keep it coming panini great job. 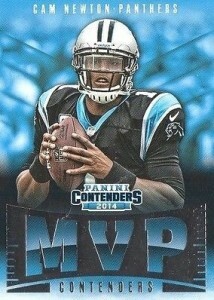 I love panini contenders and the 2014 product is even better then the 2013 one. This is one product that I will always purchase love the jersey cards with the blaster boxes. I actively participate in Box Breaks on Ultimateboxbreaks.com. I had the Colts and the Dont’e Moncrief Superbowl Ticket was pulled. 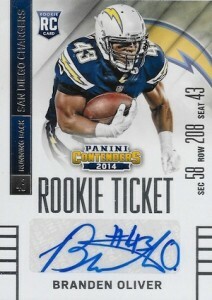 Every year Contenders prove to be a fantastic product, Chasing the Variations is always a blast. I look forward to every year when the product is released. Am I the only one who bought a blaster box of panini contenders and pulled a complete base set #1-#100?! I think there’s no challenge in that! But I Like the inserts and puller a Rookie Variation Auto so not bad I guess but I was blowing my mind when I got a complete set off of one blaster! A little over a month since I last posted on here & I’ am fortunate enough to still be pulling big hits. 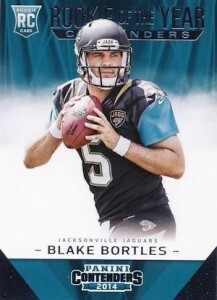 Panini did an excellent job with the looks and detail of the contenders this season that I keep finding myself buying more, so I hope they keep it up next season. Good pulls since my 1st box: PT VAR II 163/199 A. Luck, CT 84/99 G. Smith, RT VAR II Auto B. Oliver, RI Auto J. Amaro, & RT PP blk Auto J. Verrett along w many other neato big name parallels & auto’s. Still looking for that elusive (to me) cracked ice, Vet MVP & Legendary Auto’s though. Happy hunting everyone! Just got a pack from Walmart because there isn’t a card shop near by but did get a johnny manziel jersey card. But no arizona cardnails out of my 5 packs they did make it to the play offs. Not a great product but not terrible either. I haven’t bought a hobby box because of the auto checklist in general not really appealing to me and having the potential of getting crap in return. Of the packs that I have bought I pulled a Tom Brady cracked ice ticket and one auto of Tajh Boyd. Nothing amazing but nothing completely useless. Feel free to email us any lists. I don’t handle many of the checklists myself but I can pass them along. We do our best to keep things updated but there are so many sets that some of the small quirks like those can slip through the cracks. 2014 Panini Contenders Sealed 3 HOBBY Box LOT x3!!! CARR Beckham GAROPPOLO Auto? 2014 Contenders Factory Sealed Football Hobby Box Jimmy Garoppolo AUTO RC ?? 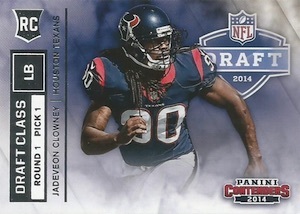 2014 Panini Contenders Football Unopened HOBBY Box 5 Autos. Jimmy Garoppolo RC? ?